Many Helicobacter pylori eradication regimens have been described. There are little data reporting their efficacy or integration in routine clinical practice. The overall results of eradication therapy in a cohort of patients are described and an algorithm for management outlined. 469 patients receiving eradication therapy in routine clinical practice were evaluated. The successes of individual regimes as first, second and third line therapy were determined. Overall success after one, two and three courses of therapy were 73% (95% confidence intervals 69–77%), 94% (91–96%) and 98% (97–99%) respectively. 10 different regimens, including many non-recommended ones were used as primary therapy. Ranitidine bismuth citrate-amoxicillin-clarithromycin triple therapy (94.8%, 90–99%) was significantly more effective than any other combination as primary therapy, including all proton pump inhibitor based triple therapies. Quadruple therapy with bismuth chelate-proton pump inhibitor-tetracycline and a nitroimidazole (70%, 52–88%) and ranitidine bismuth citrate-based triple therapy (73%, 56–90%) where more effective second line combinations than proton pump inhibitor-triple therapies (37.5%, 12–58%). Third line therapy directed by the results of sensitivity testing improved eradication compared to further empirical antibiotics. The use of a proton pump inhibitor with clarithromycin and a nitroimidazole as initial therapy was associated with a significantly worse overall eradication rate than other combinations. Helicobacter pylori eradication rates can be maximised by using ranitidine bismuth citrate-clarithromycin-amoxicillin containing triple therapy, followed by bismuth and nitroimidazle containing second-line therapy, with third line combinations directed by sensitivity testing. Proton pump inhibitor-clarithromycin-metronidazole combinations should be avoided. Treatment of gastric H. pylori infection with combinations of antimicrobials is recognised as the treatment of choice for those patients carrying the infection with peptic ulcer disease and gastric MALT-lymphoma [1–3]. Antimicrobial therapy is usually recommended following potentially curative resection of gastric cancer and in the presence of dysplasia . The place of H. pylori eradication therapy in the management of patients with dyspeptic symptoms without ulceration is the subject of much debate, but undoubtedly eradication therapy is widely prescribed for this group [4–8]. Randomised clinical trials have demonstrated that 7-day proton pump inhibitor (PPI)-based triple therapies are the usual treatment of choice for H. pylori infection [9, 10]. More recently ranitidine bismuth citrate (RBC) and two antibiotics has been demonstrated to be an efficacious first-line therapy [11–14]. Even with currently optimal treatments there is a small but significant failure rate (10–25%) and it has been emphasized that H. pylori treatment strategies need to be planned to optimise the overall eradication rates, rather than concentrating on the results of a single treatment . To this end it will be necessary for repeated courses of therapy in order for eradication rates to approach 100% once a decision to treat has been made. Despite the publication of many reports of successful eradication regimes, there is relatively little data reporting the overall results in patients requiring repeated courses of therapy, particularly during the course of routine clinical care. Therefore the efficacy of H. pylori eradication in a cohort of patients having routine hospital in- or outpatient care has been studied. The primary aims of the study were to describe the use and effectiveness of the regimens prescribed by all clinicians dealing with H. pylori infection and to report the influence of each of those regimens on overall success. From this data it has been possible to construct an overall strategy to maximise H. pylori. All adult patients with a confirmed diagnosis of H. pylori infection who received at a first course eradication therapy as part of their standard in- or outpatient clinical care at the James Paget Hospital and completed an appropriate follow up between February 2000 and May 2001 were included. Patients who had received any eradication therapy prior to February 2000 were excluded from the analysis. Patients were identified from discharge coding, endoscopy unit database, histopathology and microbiology databases and pharmacy records. Follow up 13C-urea breath testing (Pylobactell®, BSIA, Middlesex, UK) was performed if an appropriate post-eradication assessment had not been performed up to that point. Prior to the initial course of eradication therapy H. pylori infection was diagnosed by either biopsy based rapid urease test (CLOtest®) or histology with imunostaining from the gastric antrum. Patients were regarded as infected if either test was positive. If endoscopy was not indicated on standard clinical grounds, patients with positive H. pylori serology had a confirmatory 13C-urea breath test before antibiotic therapy. Follow up was by 13C-urea breath test at least 4 weeks after cessation of therapy. In those patients undergoing endoscopic follow up after eradication therapy, biopsies were taken for culture and sensitivities (one biopsy from antrum and corpus) and histology with immunostaining (two each from antrum and body). Culture was performed in under microaerophilic conditions at 37°C and clarithromycin and metronidazole sensitivities assessed by E-test. Metronidazole resistance was defined as MIC > 8 mg/l and clarithromycin resistance as > 2 mg/l. Patients were regarded, as H. pylori negative if all biopsy-based tests at follow up were negative. A 13C-urea breath test was performed if biopsy sampling was inadequate and was regarded as the gold standard for the presence of H. pylori. All patients who had H. pylori eradication during the period were included. Patients could have been under the care of any of the specialities prescribing eradication. The relevant specialities were two medical gastroenterology teams (each headed by an attending (consultant), one with a special interest in H. pylori infection), general surgery (5 teams) or internal medicine (7 teams). Each clinical team had freedom to prescribe any eradication regime. At the time of the study, the district-wide guidelines indicated the favoured eradication regime was a 7 day course of proton pump inhibitor combined with two of the following antibiotics: amoxicillin (A), metronidazole, clarithromycin (C). These are consistent with British Society of Gastroenterology guidelines . Some patients were referred back to their primary care physician, who then decided the exact choice of therapy. Subsequent treatment after initial failures was again at the choice of the responsible clinician. However, an increased proportion of the patients requiring second line (57%) and all those requiring third line were referred to the care of the gastroenterologist (the author) with a special interest in H. pylori. In general, second line therapy was chosen empirically, using whichever of clarithromycin or metronidazole was not used initially. All patients requiring third line therapy underwent endoscopy, choice of therapy being guided by sensitivities. No attempt was made to differentiate the effects of different proton pump inhibitors (regimens containing omeprazole, lansoprazole and rabeprazole were all used in twice daily dosage) or nitroimidazoles (N)(metronidazole and tinidazole in either twice or three times daily dose)[13, 14]. Clarithromycin and erythromycin (E) were analysed independently. Not all patients continued with repeated courses of eradication therapy after an initial failure. Several factors contributed to this, choice of patient or clinician not to repeat therapy in cases of non-ulcer dyspepsia, patient lost to follow up. Differences between eradication rates were assessed by Chi Square with correction for multiple comparisons. Results are expressed as eradication rates or odds ratios with 95% confidence intervals. Four hundred and ninety patients received eradication during the period of the study, 469 were evaluable. The remaining 31 were lost from follow up or had inadequate data available. The indications for anti-H. pylori therapy were: duodenal ulcer 151 (32%), gastric ulcer 107(23%), non-ulcer dyspepsia or not endoscoped 203 (43%), previous gastric surgery 5 (1%), mild dysplasia 3 (1%). Of the original courses of therapy: 249 (53%) were prescribed by either of the gastroenterologists, 68 (14%) by internal medicine specialists, 103 (22%) by general surgeons and 49 (10%) by primary care physicians. A total of 10 different regimes were prescribed (see table 1). A 7 day PPI plus two antibiotic regime was used in 356 (76%) of cases, ranitidine bismuth citrate-based dual or triple therapy in 105 (22%) and non-standard regimes in 9 (2%). The non-standard treatments were PPI with erythromycin and amoxicillin, PPI with erythromycin and metronidazole, PPI with tetracycline and metronidazole and PPI with amoxicillin, metronidazole and clarithromycin. The overall success rate was 343/469 (73%, 95% CI 69–77%). The results for the individual regimes are shown in table 1. There were no significant differences in the numbers lost to follow up in the different groups. All nonstandard regimes were unsuccessful. There were no significant differences in the eradication rates for the different regimens when the setting (primary vs. secondary care) or endoscopic diagnosis were considered. Results of first line H. pylori eradication therapy. *RBC-A-C was significantly more effective than PPI-A-N, PPI-C-N, PPI-A-C (all P < 0.01). Ranitidine bismuth citrate triple therapy with amoxicillin and clarithromycin (RBC-A-C) was significantly (P < 0.01) more effective than all of the PPI-triple the therapy regimens. There was no significant difference between any of the PPI-triple therapies. RBC-clarithromycin dual therapy for 14 days and RBC-C-N triple therapy for 7 days were used very successfully (100% success) in a small number of patients with penicillin allergy, but the numbers involved were too small to draw comparative conclusions. Sixty-six patients received a second course of eradication therapy. The choices of second line therapy, following failed initial therapy are shown in figure 1. Six different second line eradication regimens were used, all of 7 days duration. The results are shown in table 2. The overall success rate was 42/66 (63.6%, 52–75.2%). Success was significantly greater with bismuth-based (either ranitidine bismuth citrate or tripotassium dicitratobismuthate (De-Nol, bismuth chelate, DCB)) (72%, 60–84%) than PPI-based therapies (37.5%, 12–58%)(P < 0.05). After two courses of therapy overall 385/409 (94%, 91.3–96.7%) of patients had been cleared of H. pylori infection. Four out of five patients initially failing RBC-A-C triple therapy were successfully treated with PPI-bismuth quadruple therapy. Of the patients with failed first line therapy with PPI-based triple therapies 12/14 (86%, 66–98%) were treated successfully with RBC-A-C triple therapy and 15/22 (68%, 51–85%) with PPI-bismuth quadruple therapy (difference non-significant). Efficacy of second line H. pylori eradication therapy. * PPI-DCB-N-T and RBC-A-C were significantly more effective than PPI-A-M as second line therapy (both P < 0.05). $ Bismuth-based (PPI-DCB-N-T or RBC-A-C) was more effective that PPI-triple therapy (P < 0.05). Twenty patients underwent a third course of therapy. All had a further gastroscopy with therapeutic regimens chosen on the basis of clarithromycin and metronidazole resistance. The choice of therapy was as outlined in table 3. Patients in whom the H. pylori culture failed were treated with 14 days omeprazole 20 mg twice daily, rifabutin 300 mg once daily and amoxicillin 1 g twice daily [18–20]. All patients having third line therapy received three agents for 14 days. Overall success rate with third line therapy was 13/20 (65%, 44–86%) and the overall success rate of patients continuing through up to 3 rounds of therapy was 398/405 (98%, 96.8–99.2%). Success with third line therapy was higher in those with a metronidazole or clarithromycin sensitive isolate (5/6) (83%) compared to those with fully resistant strains (6/10) or unknown sensitivities (2/4). Choice and efficacy of third line H. pylori eradication. Regimens were chosen following culture and sensitivity testing after failed 2nd line therapy. Initial regimes containing both clarithromycin and a nitroimidazole were associated with significantly worse results overall, with lower eradication rates after logically chosen second line therapy and sensitivity-directed third line therapy. After two courses of therapy 13.7% of patients initially treated with PPI-nitroimidazole-clarithromycin were still infected with H. pylori compared to those receiving initial courses of PPI-A-C (4.7%) or RBC-A-C (1%) (both P < 0.01). Similarly PPI-nitroimidazole-clarithromycin initial therapy was significantly associated with both the subsequent isolation of combined clarithromycin and metronidazole strains (OR 2.25, 1.05–15.7, P < 0.05) and failure of third line therapy (OR 14.9, 1.01–71, P < 0.01). Of patients who continued through 3 attempts at eradication, five of the seven failing 3 courses were initially exposed to nitroimidazole-clarithromycin therapy. This study on a large cohort of patients in routine clinical practice has demonstrated several important findings relevant to the efficacy of anti-H. pylori therapy. Firstly, despite the ready availability of recommendations and published literature a wide variety of eradication regimens were prescribed as initial therapy, these included several ineffective and not recommended regimens. Despite the initial use of sub-optimal regimens, the overall successful eradication rates in the cohort of patients undergoing second and third line therapies were extremely good at 94% and 98% respectively. This suggests that it is possible to devise a logical algorithm to maximise eradication rates within a population. The efficacy of RBC-A-C initial therapy exceeded PPI-based therapies, suggesting that this therapy should be used more widely in clinical practice. The final important conclusion was that although 1st line eradication rates were equivalent for all PPI-based triple therapies, the use of an initial PPI-C-N regimen was associated an overall decrease in eradication rates and subsequent increased isolation of dual clarithromycin and metronidazole resistant strains. This suggests that this combination should be avoided within and overall management strategy. Following the reporting of several large clinical trials it has been accepted that 1 week PPI-based triple therapies are the treatment of choice for H. pylori infection . Overall PPI-A-N therapy produces inferior results to clarithromycin-based combinations and several influential guidelines and recommendations advocate initial use of PPI-clarithromycin plus either amoxicillin or metronidazole [1, 9]. The current British Society of Gastroenterology guidelines (which are due for revision) do not specify a preference for any of the 3 PPI-based triple therapies  and several important studies reporting the development of successful use of PPI-A-N originated from the local area . Thus this regimen is well established in the geographical area and this probably explains the continued frequent use of this regimen. Despite the available evidence and guidelines, a variety of non-standard choices of therapy were made by non-gastroenterologists. These were all ineffective and patients required further treatment. Other studies have also demonstrated the difficulty many clinicians have in assimilating the data and guidelines on the plethora of eradication regimens, leading to confusion and resulting in the use of ineffective combinations [22, 23]. Therefore to make best use of resources it is important that the dissemination of best current practice and continued education of clinicians dealing with H. pylori infection continues. Although randomised trials can provide evidence on the maximal effect of treatments under ideal conditions, it is still important to consider the actual efficacy of treatments in routine clinical care when planning local delivery arrangements. This has been illustrated here by the variety of regimens used by clinicians. Thus retrospective studies can compliment randomised trials. In everyday practice, factors other than actual treatment regimen may affect efficacy, such as counselling regarding compliance, availability and accuracy of advice and clinician interest in the problem. These factors are removed in a formal randomised trial but may have had an effect in the retrospective review. It was not possible to assess the effect of seniority or speciality of clinician prescribing therapy on eradication because of the many doctors in training associated with each team, rendering it impossible be certain who specifically provided advice to the patient and final choice of eradication therapy. Analysis of those regimens prescribed by multiple teams, did not show any significant effect of team speciality on eradication rates. RBC-containing regimens were only used by the gastroenterologist with a specific interest in H. pylori; this may have contributed to the excellent results by improving compliance. It is worthwhile noting that results for PPI-A-C from this team were not superior to other teams. Recent studies have confirmed that ranitidine bismuth citrate combined with clarithromycin and either a nitroimidazole or amoxicillin is an effective first line therapy for H. pylori. Results are not generally different from the corresponding PPI-based therapy in clinical trials and although not widely used, some authors have suggested that RBC-triple therapy should also be regarded as a first line therapy of choice [13–15]. In the current study RBC-AC was the most efficacious first line therapy, the reason for the apparent superiority compared PPI-triple therapies is not clear. No attempt to assess compliance was made and clinical trials suggest little difference in compliance between RBC- and PPI- based therapies [13, 14]. However in everyday clinical practice, as opposed to a closely monitored trial overall compliance may be lower, although the enthusiasm of the relevant clinician may have a role as discussed above. There appears to be synergism between RBC and antibiotics and this enhanced antibacterial effect may offset any loss of effect induced by failure to complete the antibiotic course . RBC-containing regimens may also overcome bacterial resistance to metronidazole or clarithromycin but in this predominantly rural Caucasian population primary antibiotic resistance is unlikely to be substantial and this is unlikely to explain the improved results of RBC-A-C . Even in the best clinical studies 15–25% of patients will fail to clear H. pylori with one course of appropriate therapy. The challenge therefore is to design an overall management strategy, which optimises eradication rates and minimised costs and the number of courses of antibiotics . Within such a strategy it is not certain how the different combinations of therapy and endoscopy and culture need to be utilised. The data presented here suggest that it is possible to plan a overall strategy with 2 courses of empirical but logically chosen antibiotics, reserving sensitivity testing only when a third line is contemplated. The importance of sensible choice of antibiotic combinations is illustrated by the overall poor results in patients initially receiving PPI-C-N triple therapy. Although the results of this group were comparable to the other PPI-triple therapies as initial therapy, the final eradication rate after repeated courses was significantly lower in this group. This failure seemed to be due to the emergence of multiply resistant strains as evidenced by the results of culture testing after the second failed course. Clarithromycin and metronidazole are the most potent antibiotics against H. pylori. Although combination therapies with both of these agents are efficacious, as demonstrated here, there is no logical choice of second line therapy in those patients in whom eradication fails. Failure of clarithromycin or nitroimidazole containing regimens is often associated with the emergence of secondary antibiotic resistance and this would be consistent with the data presented here . The treatments of multi-resistant H. pylori remains problematical, several regimens have been used but there is not consensus as to the choice of treatment . Therefore, as suggested previously , steps should be taken to minimise the problems of secondary resistance and to this end, it is suggested that PPI-C-N regimes are not used as initial empirical therapy. There are relatively few data reporting the efficacy of second line therapy, and further large randomised and cost-efficacy studies awaited. In the current study empirical second line therapy was effective when chosen logically. From this it can be concluded that the second regime should use whichever of clarithromycin or nitroimidazole was not used initially. Overall, bismuth-containing (whether RBC or bismuth chlelate) therapies were more effective as second line treatments than PPI-based triple therapies without bismuth. This is in agreement with a recent report highlighting the better results with second line bismuth-based therapy . Quadruple bismuth-containing therapy performs well even in metronidazole-resistant cases and in a small study was effective for RBC-triple therapy failures [28, 29]. The complexity and number of tablets inherent in quadruple therapy suggest it is most suited to a rescue role rather than initial therapy. For first line clarithromycin failures, 1 week quadruple therapy with a PPI, bismuth chelate, tetracycline and a nitroimidazole seems the logical choice. Seven-day therapy with RBC-tetracycline and a nitroimidazole was effective in the small number of patients and may become the treatment of choice in future if further studies continue to be supportive [11, 30]. In one comparison of "salvage" regimes, RBC-N-T produced superior eradication rates than quadruple therapy (83 vs 57%) . If the initial failed regimen contained a nitroimidazole; a clarithromycin and amoxicillin-containing regimen (either RBC-A-C, or PPI-A-C) would be the logical choice. The current study suggests RBC-A-C is the logical choice in this situation as it produced significantly better second line eradication than the PPI-based therapy. Future studies reporting head to head comparisons of RBC and bismuth chelate-based second line therapies will be useful in guiding future therapy. Having used both clarithromycin and nitroimidazole-containing regimens, there is no logical effective choice for 3rd line therapy, although only about 6% of patients will reach this point. Therefore if H. pylori eradication is desired in such patients, endoscopy, culture and sensitivity-directed therapy seem appropriate. In the current study 3rd line eradication was more effective in those with sensitivity-directed therapy than either empirical "blind" therapy in culture failures or multi-resistant strains. Further studies with novel regimens in multi-resistant strains are awaited. 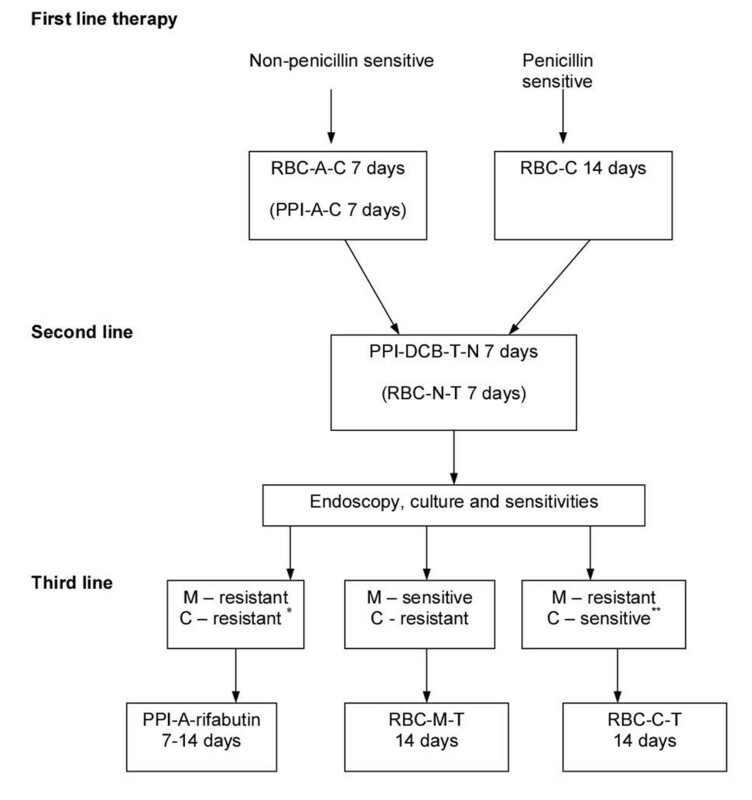 The combination of PPI-amoxicillin and rifabutin was used for 3rd line patients with multi-resistant or unknown resistance pattern strains. This regimen shows some promise as final salvage therapy; success rates in the region of 60–85% have been reported. This success rate of this combination may be independent of clarithromycin and metronidazole sensitivities [18–20]. In the current study the success rate of RBC-based sensitivity-directed therapy was superior to PPI-A-rifabutin triple therapy; this suggests that endoscopy and sensitivity testing at this point is worthwhile rather than more widespread use of PPI-A-rifabutin. The choice of therapy in penicillin-sensitive patients remains problematical. As outlined previously PPI-C-N combinations should probably be avoided because of the adverse effects on overall eradication rates. RBC-C-N would be an alternative; in randomised trials this combination achieved higher eradication rates than other triple therapies but approximately 15% of courses were still ineffective [13, 14], thus the risk of treatment failure would be minimised. However there is still no rational choice of second line therapy after RBC-C-N and further reports of the overall efficacy of this regimen after second line salvage are needed. A 14-day combination of RBC and clarithromycin is an alternative for penicillin-sensitive patients: eradication rates of 71–86 % have been reported [11, 31, 32] and this regimen has the advantage of logically being followed, if needed, by PPI-bismuth-nitroimidazole-tetracycline quadruple therapy. This study on the overall efficacy of H. pylori eradication has demonstrated that greater education of clinicians regarding choice of suitable regimens is needed. The data show that rates of eradication within a population can be maximised by logical choice of therapies. Initial therapy with PPI-C-N was associated with an increased risk of failure to clear the infection. It is suggested that first line therapy with a clarithromycin-amoxicillin containing triple therapy is followed by a bismuth-nitroimidazole-based second regimen. In view of the small numbers of patients failing this second line therapy, endoscopy and sensitivity testing can be reserved for third line therapy (see figure 2). It is recommended that those prescribing H. pylori eradication therapies continually assess their success rate and adjust the relevant local practices and policies in line with the results and local bacterial resistance patterns. More research is required on the integrated use of the different combination therapies; these studies need to consider overall efficacy as well as cost effectiveness when comparing different regimes and different antibiotic doses. Detailed studies of second and third line therapies are particularly needed. Suggested algorithm for eradication therapy in H. pylori infection. Regimens in parentheses are alternatives at each stage. *PPI+rifabutin+amoxicillin can be used when sensitivity testing is unavailable. **Isolates sensitive to both clarithromycin and metronidazole can be treated with RBC-C-T. Abbreviations used in the figure: A-amoxicillin, C-clarithromycin, T-tetracycline, N-nitroimidazole, M-metronidazole, PPI-proton pump inhibitor, RBC-ranitidine bismuth citrate. Dr Beales has received research funding from Astra-Zeneca and financial support for educational activities from Astra-Zeneca, Janssen-Cilag and Wyeth. Dr Beales holds a number of mutual finds with investments in a variety of pharmaceutical companies.